As these were our first annual Awards all art works submitted to us up to 31st December 2015 were considered. We make two Awards, one for a Series of work and one for an individual piece. In truth, we wish we were able to make several Awards, but we do not have the budget for that at present. Many of the artists here made work that is deserving of an Award. 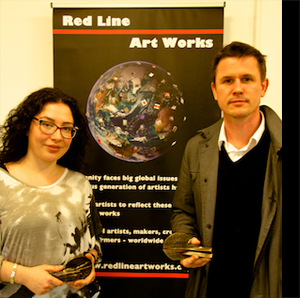 We congratulate the winners of the Annual Awards for Red Line Art Works and all the artists whose work was 'Highly Commended'. Luke Jerram (UK) for his installation 'Withdrawn', which lasted several months and incorporated many different events and activities. Many tens of thousands of people visited this work and it generated extensive approval and publicity. Rita Lazaro (UK) for her work 'Some of Us Need More'. This work appeared in our first Exhibition of Red Line Art Works. We know that it elicits strong approval from the audience and is a technically accomplished piece. We know that both of the Winning works this year have made a strong impact on the audience, not only an arts audience but also the wider public. You can see details of the Award Winners in 2017 here.